In a first the Gold Resource Corporation (GRC) is to issue Gold and Silver Dividends to its shareholders. In a recent press release GRC announced the launch of a novel and innovating gold and silver dividend program for it's shareholders. Gold Resource Corporation, a low-cost gold producer with operations in the southern state of Oaxaca, Mexico, has paid 20 consecutive monthly dividends totalling over $41 million returned to shareholders, since they declared commercial production. The company dividend will continue to be in cash but a unique option for shareholders is the ability to convert their dividend into gold and silver. 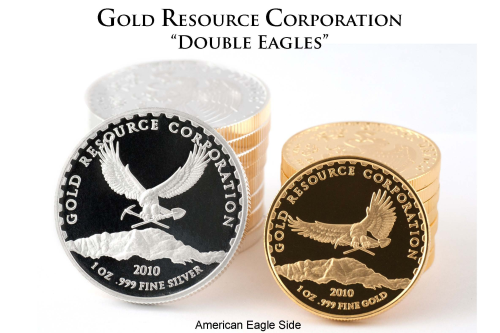 This will be done through an "individual bullion account," in which the shareholders cash dividends are converted into Gold Resource Corporation "Double Eagle" one ounce .999 fine gold and/or one ounce .999 fine silver rounds. Gold Bullion International (GBI) is the institution that will facilitate the cash dividend to physical gold and silver conversion. GRC will instruct GBI to draw gold and silver Resource Corporation Double Eagles from the Company's minted physical treasury and distribute precious metals as directed by Company shareholders. "A convenient and simple way of delivering precious metal dividends to shareholders has been a long-term goal of the Company," stated Jason Reid, President of Gold Resource Corporation. "With innovative assistance from Gold Bullion International, management of Gold Resource Corporation is pleased and excited to announce the launch of the Company's gold and silver dividend program, a dividend program unlike any other known program offered of its kind." According to a recent GRC Press Release, "The program powered by Gold Bullion International's operational and technology platform will allow shareholders to fully manage their cash dividend conversions into gold, silver, or a desired percentage of each metal. After conversion into a physical metal dividend, shareholders may elect to store their physical within GBI's fully insured and audited storage facilities (for a nominal fee), take direct delivery of their precious metals, or direct the shipping of the metals to a vault of their choice." Where a shareholders dividend is less than one ounce of silver or gold, the shareholders cash dividends can be accrued until they have a sufficient balance for the conversion into one ounce denominations of gold or silver. Mr. Reid stated, "Gold Resource Corporation provides premier precious metal exposure with an aggressive production growth profile of low cost ounces, growing cash and physical precious metal treasury, high-grade exploration prospects, distribution of a monthly dividend and in April 2012 another major milestone for the Company is being set as we prepare to launch the option for shareholders to receive gold and silver dividends." Mr. Reid continued, "Gold Bullion International and Gold Resource Corporation are on the verge of a groundbreaking and monumental shift in how mining Companies may distribute dividends to their shareholders in gold and silver." About GRC: Gold Resource Corporation is a mining company focused on production and pursuing development of gold and silver projects that feature low operating costs and produce high returns on capital. The Company has 100% interest in six potential high-grade gold and silver properties in Mexico's southern state of Oaxaca. The Company has 52,902,620 shares outstanding, no warrants and no debt. About Gold Bullion International: Gold Bullion International (GBI) is a leading institutional precious metal provider to Individual Investors and the wealth management industry. For Shareholders of Gold Resource Corporation, the issuing of Gold and Silver Dividends is indeed a new way to 'buy gold and silver'.